Chatting is a method of communication much favored by people, especially those who face their computers every day. Some chatting tools let the user talk to a lot of people at one time and some don’t, allowing conversations on a one-on-one basis only, while there are also some that favors both. There are also others that have other functions that compliment the tool itself and provide a better chatting experience for its chatters. One such tool is Chatwing – a chat widget that anyone can use. 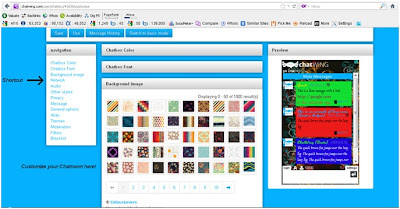 Chatwing is a tool that can easily be embedded into any site to compliment it by providing the site’s viewers a more direct method of communication with the site owner or with any other people through live chat. It’s a very useful supporting tool that makes relaying a concern or a problem about the site to the management much easier and faster. And with Chatwing, there are no worries that people can’t join in because of it having too much people inside – it will take 7000 people inside before the chatting tool says no to having more. It has been four months since Phewtick was introduced in Singapore and since I already received my first cash out, I can finally write my experience with Phewtick. I actually got acquainted with the Phewtick app early this year after noticing that most of my friends in Singapore were suddenly posting their Phewtick meet-ups in Facebook. I ignored it of course but when my colleague informed me about it, I finally went on board and downloaded the free application from the App Store. Initially, it was only available in iPhones but now it is also available in Android. Before you start earning money, you need to download the app. Your friends, colleagues and family members need to download the app as well. Open the app and make sure the location service of your phone is enabled. Phewtick actually checks your current location. The app will show a QR code that your friends can scan to earn Phewtick points. There's a scan button in the app so it can either be you or your friend who will be scanning. It has been four months since I have received my last Google Adsense check. Hopefully, 2013 will bring me better blogging earnings. This cheque by the way is my first cheque of 2013 and months covered for this earning is from October 2012 to February 2013. Thank you Google Adsense for the S$138.86! 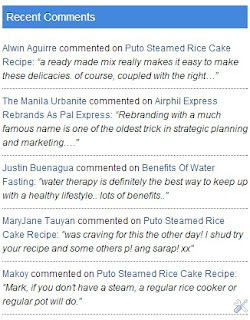 One way to attract readers to comment more in your blog is to show your visitors' recent comments. Blogger currently doesn't have a ready gadget for the Recent Comments to show, that's why the script below is the answer. 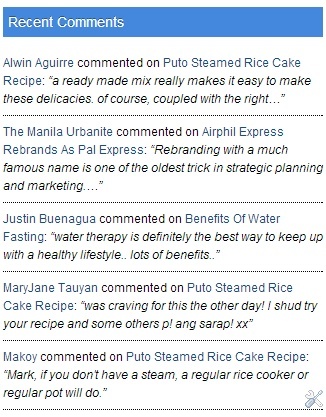 The script will actually read from the comment feed of your blog, just like the post feed we usually subscribe to. The script below can be customized to the number of comments and the length of comments to be shown. It will just take you a few steps to do in Blogger so here are the steps. 1) At your Blogger dashboard, select Layout. 2) Click the Add a Gadget link from the section you want the recent comments to appear. 4) From the title, add your desired title, for me Recent Comments is just right.